The Bush Machine plays for keeps—and this time, they hauled out the heavy artillery to shoot down Romney. Bush speaks at an Economic Club of Detroit meeting on February 4, during his "Right to Rise" tour (AP Photo/Paul Sancya). Jeb Bush won the Republican Party’s “establishment primary” in late January when Mitt Romney gave up on the fantasy that the third time’s the charm. Romney may have topped Bush in many polls, but the party’s 2012 nominee was never more than a junior partner in the GOP establishment. Bush is a senior partner, a member of the first family of elite Republicanism. These are economic elites who do not care much about being loved by the party base. But they do care about winning. To that end, the Bushes have for generations put their time and energy into managing the party on behalf of the elites with whom they are aligned. When one Bush finishes campaigning, another begins. Around the Bushes are arrayed longtime donors, energy-industry and Wall Street worthies, bundlers of millions (perhaps billions), strategists, pollsters and the hangers-on who form a permanent political infrastructure. The party establishment is a machine, and it runs a certain way: a Bush has been on every winning Republican ticket since 1980. The Bushes have always had rivals. But Romney, a frequently undisciplined contender, was never going to beat Bush for the 2016 nomination. Romney threatened to divide the establishment, however, so the Bushes provided a crash course in Republican Politics 101: They highlighted the Bush network, which is more loyal and connected than those of Romney, Chris Christie, Scott Walker or any other potential contender. They highlighted the Bush fundraising operation, which reportedly plans (though they won’t acknowledge it publicly) to raise an unprecedented $100 million during the first quarter of 2015. They highlighted the fact that Jeb has the Bush name: a branded presidential identity to counter that of Democratic front-runner Hillary Clinton. If those details did not convince Romney, he got the message when the Bush camp announced that David Kochel, a Romney strategist in 2008 and ‘12, had joined the Bush enterprise as a potential campaign manager. Why the rush to establish Bush’s position? 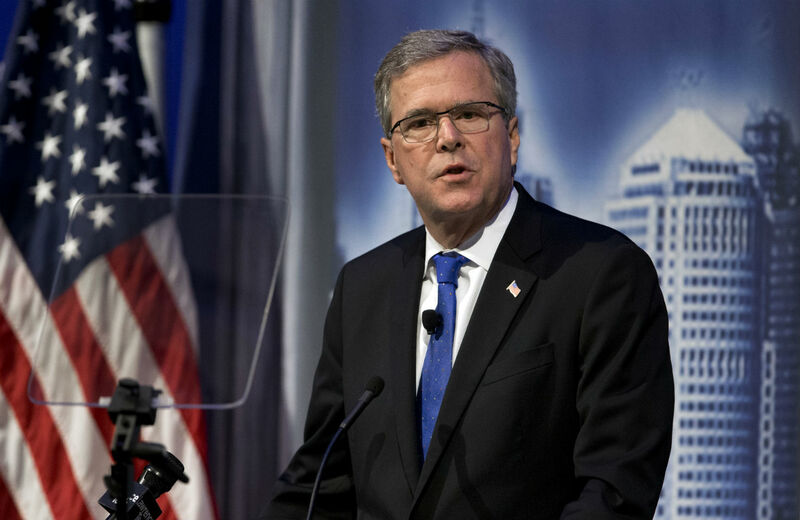 The Bushes and their allies know that a united GOP establishment is a powerful entity. So the “establishment primary” matters; it’s where the real work of minting a nominee begins. That’s not merely because the party’s permanent political class is efficient. It’s because the establishment knows the true-believer party base will, invariably, have to be dragged kicking and screaming into the camp of the anointed contender. Today’s GOP establishment can be every bit as extreme as the base when it comes to restricting reproductive rights, signing “stand your ground” laws and mangling education policy. Jeb Bush checks all those boxes. But the religious-right faithful, Tea Partisans and Rush Limbaugh listeners who form the base are well aware that the establishment’s extremism is often a political calculation. A President Jeb Bush might advocate conservative social policies, but that would not be the point of his presidency. The political wing of the GOP establishment exists to assure that when the party takes charge, the economic wing also takes charge. GOP elites don’t play politics as a game; they engage in a crucial competition for power—and the spoils of power. (The Democratic establishment is similarly motivated, and similarly prone to “follow the money,” but it lacks the history, structure and discipline of its rival.) The Bushes and their allies have decades of experience when it comes to securing and utilizing power—not on behalf of an ideology or even a partisanship but for an agenda: tax policies that favor the rich, regulatory policies that favor the banks, corporate-friendly “free-trade” deals and whatever else is on the US Chamber of Commerce wish list. That does not make the GOP establishment moderate or immoderate. It just gives the establishment and its candidates what matters most in politics: a reason for being. And, from it, the focus and ambition that characterize the establishment’s political interventions. Does this mean that Jeb Bush will be the nominee? Not necessarily. The transparent mission of establishment candidates often makes them a hard sell with base voters. Establishment Republicans have lost before: in 1964, to a Barry Goldwater they thought to be too extreme; in 1980, to a Ronald Reagan and his “voodoo economics”; in 2008, to a John McCain who was too squishy on the essential issue of maintaining the avenues of influence paved with campaign-donor gold. The establishment faces additional challenges created by the new-money politics of the Citizens United era. Donors like the Koch brothers are less tied to the establishment and more adventurous ideologically, but they tend to play along with it in general elections. The more serious annoyance for the establishment is the prospect that a rogue mogul can sustain a ridiculous candidacy for far longer than in the past—as billionaire Sheldon Adelson did for Newt Gingrich in 2012. But the establishment still maintains the upper hand. The Republican National Committee recently slashed the number of debates and put establishment-friendly networks—Fox News, Fox Business, CNBC—in charge of five of them. The primary schedule has been tightened, and the date of the convention moved from late August to mid-July, strengthening the ability of candidates with money and infrastructure to overwhelm those with more grassroots appeal. There will be primary fights. The race for the Republican nomination is far from done. But the “establishment primary” has been decided. Jeb Bush is the winner.